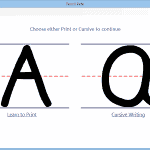 Feel free to download a trial version of Pencil Pete's® Learn to Print and Cursive Writing Software and see why it's trusted in homes and classrooms around the world! Want to read more? Note: Only letters A-F (upper and lower case) are available in the trial version, but there is no time limit. Visit the order page to buy a registration code that will unlock all of the letters, no need to download the application again! At the moment this is for Windows computers only.